Get a taste of the Vigilante's automotive prowess in the haunting new Transform Race, Inferno. Soar through a hellish landscape in the Ultralight, transform into the Beast and leap through a burning wilderness, then rip through the streets in the Vigilante - and earn double payouts as all Transform Races continue to serve up Double GTA$ & RP through October 30th. There’s a dead man walking in Los Santos, and it could easily be you. Just in time for Halloween, the nightmarish Adversary Mode Condemned marks one unlucky player for imminent death: when the timer runs out, they’re worm food. Their only hope is to pass the bad news onto somebody else, and the only way to do that is by sending them on a short trip to a shallow grave. Last man standing wins. Earn Double GTA$ & RP in Condemned now through November 6th. Keeping the earnings going, Smuggler's Sell Missions will also provide Double GTA$ & RP payouts to all participants through the 6th. And for the loyal associates who risk life and limb to execute your devilish deeds, Double GTA$ Salary payouts. To celebrate four years of Southern San Andreas mayhem, we're offering up a few treats to any and all players who log in to GTA Online at any point through November 6th. 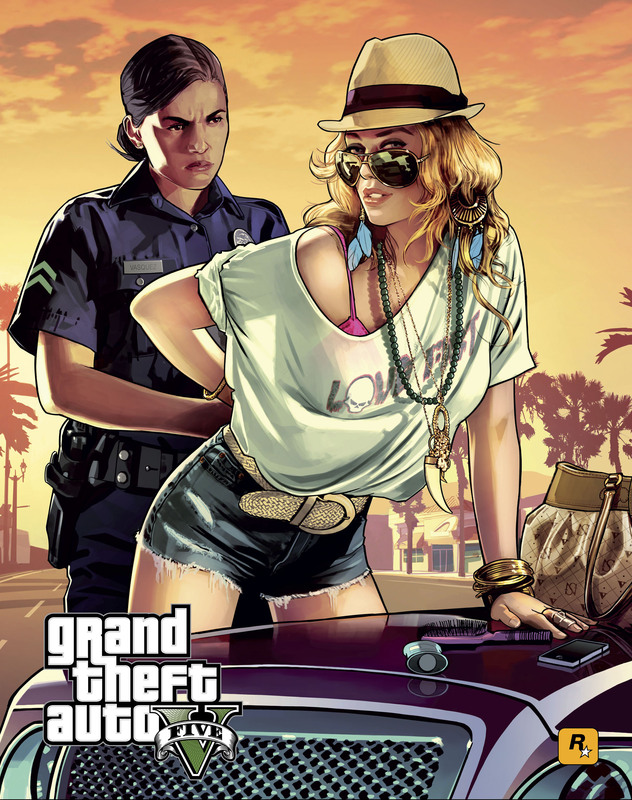 Anyone who plays during the period will receive a GTA$400,000 award that will be deposited in their Maze Bank account between November 6th and 13th. For costumed crazies roaming the streets in preparation for Halloween, not only are Halloween Masks and Facepaint you know and love returning to Los Santos at a 25% discount, but we're slashing 25% off the Fränken Stange, the Lurcher and the demonic LCC Sanctus, all returning as well. On top of these ghoulish tricks and treats, all players will also be gifted a trio of classic in-game horror film t-shirts for logging in: the Cheerleader Massacre 3 T-Shirt, the Vinewood Zombie T-Shirt, and the Knife After Dark T-Shirt. 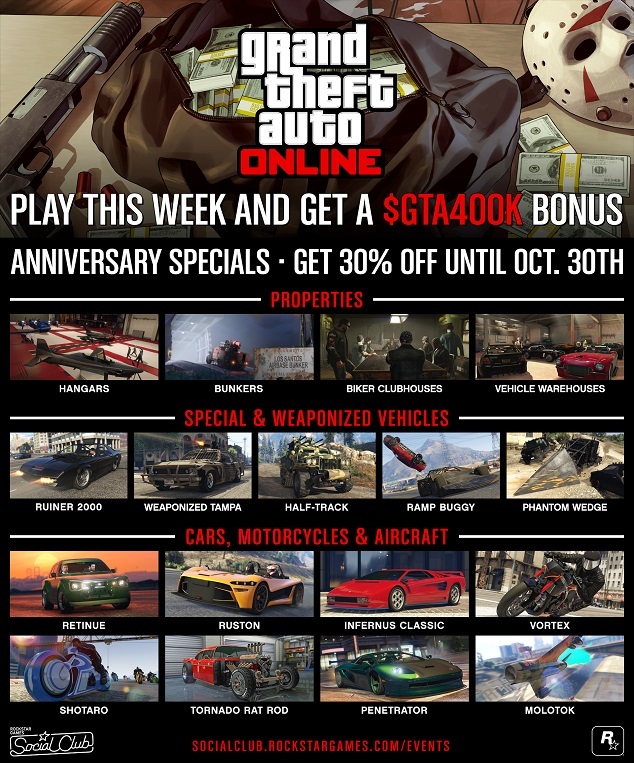 And as part of the four year GTA Online celebration, there is also an outrageous selection of items on discount this weekend - everything from properties like Hangars, Biker Clubhouses, Bunkers and Vehicle Warehouses - to select Super cars, motorcycles like the Shotaro (remember to play Deadline to unlock this bike! ), Special Vehicles and Weaponized Vehicles, are on sale through October 30th. 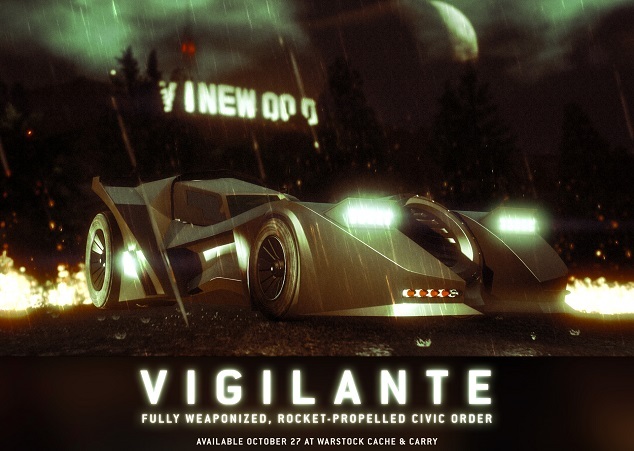 Vigilante Now Available & 4 Years of GTAO - Celebrate 4 years of GTA Online with the new Vigilante (aka Batmobile), the return of Halloween content, and tons of bonuses and discounts!